Anthem is now officially less than a month away from its release, and only two days away from the VIP demo planned for this weekend. The developers are slowly starting to spill more details, showing confidence in the game. 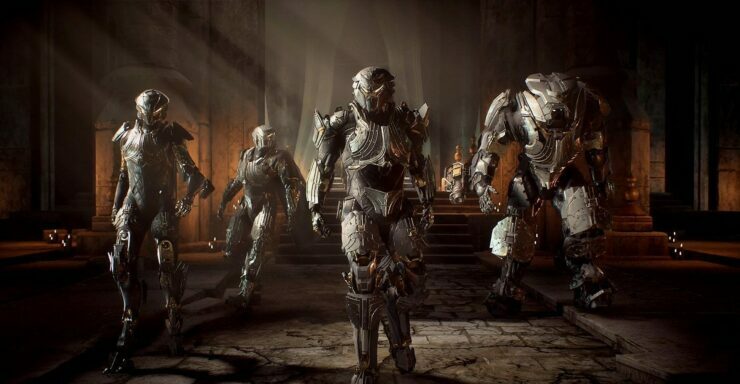 For example, Cameron Dayton, who joined BioWare last month as the new Narrative Director, posted a series of tweets on his profile praising Anthem’s story. There’s a stark difference between Anthem and any other games out there. BioWare has been on the front lines of narrative in games for years, and Anthem is blazing some new trails. The characters and plot of Anthem encompass some of the most interesting and powerful arcs I’ve ever had the opportunity to work with. This is not a narrative about flying metal suits or alien worlds. It’s a story about humanity. An industry veteran with more than twenty years of career under his belt, Dayton was a co-founder of Chair (now owned by Epic), worked on several Blizzard games such as Overwatch, World of Warcraft, Diablo III and Starcraft II before moving to Sledgehammer Games where he directed the Nazi Zombies mode of Call of Duty: World War II. In other Anthem news, BioWare General Manager Casey Hudson posted an aptly titled ‘One Month To Go’ message yesterday where he highlighted that Anthem will launch with a ton of content and a substantial main story, though it will ultimately evolve in a direction dictated by players’ feedback. Back in 2012 when we first conceived of Anthem (then codenamed DYLAN), we wanted to create a whole new fictional universe, full of BioWare quality story and character. We also wanted it to be an experience you could share with friends, and to have a story that doesn’t just come to an end but takes place in a world where things are happening right now. We’ll have more coverage about Anthem very soon. Stay tuned!